Reliance increase 3G mobile net pack Charges by around 26%. After attracting many customers, with the tag line as “Bringing 3G speed at 2G rates” offered from July 2013. According to reports, the reliance telecom has reduced benefits of internet packages by 60%, disappointing their subscribers(while the mobile net package is still best then other service provider). Instead of benefiting 1GB of data pack by paying only Rs 123, now subscriber need to pay 36 Rs extra i.e 156 RS, to subscribe the same plan, and providing 400MB of 3G data with Rs 123. Same can be observed on Rs 246 and Rs 492 mobile net plan of Reliance, i.e free data will be 1.5 GB and 3 GB data respectively for the plans, which was earlier 2 GB and 4 GB for the same plans or cost. Check Reliance 4G services, plan and offers. 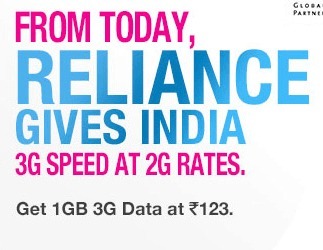 Do comment below if you find any good data plan of 3G reliance.